I am a fan of uncomplicated soups. For me, soup is the ultimate comfort food that should have minimal ingredients and come together quickly. Soup is what I make when I have some odds and ends left floating around the refrigerator. 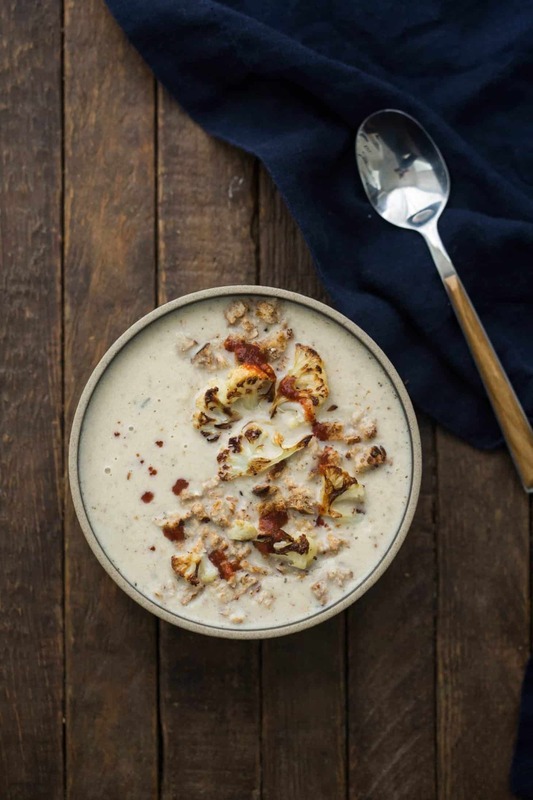 This cauliflower soup, in particular, is perfect for slightly older cauliflower that is needing to be used. I recommend cooking up a large batch of roasted cauliflower to make this soup and this cauliflower salad. The best soups, in my opinion, are not fussy. Soups shouldn’t have a long list of ingredients because I feel the flavor is rooted in the vegetables, alliums, and broth. Add-ins are great and as you’ll see in this recipe, I’ve added a pinch of dried thyme. The herbs can be switched, however. Use rosemary or tarragon in place of the thyme. In terms of the alliums, try using shallots or spring onions instead of the traditional onions. I recommend using what you might have on hand or whatever happens to be in season! Also, if I’m really trying to make this soup without too much fuss, I’ll often roast the alliums with the cauliflower. Either way is delicious. One of the things I love most about this soup is the ability to take it vegan, fairly easily. You’ll see in the recipe the main non-vegan item is the cream. Swap the cream for a vegan friendly alternative like a vegan creamer, cashew/sunflower cream, or something like this millet cream. This soup makes the perfect base for a cheese soup. The creaminess already feels a bit like it should have cheese in it so I don’t necessarily feel like you need to add it. However, the option is there. If you have plans to add the cheese, reduce the thyme to just a pinch. After the soup has heated with the cream, add about an ounce or two of shredded cheese. My preferred options include sharp cheddar cheese, veg-friendly parmesan, or a nice melty cheese like gruyere. 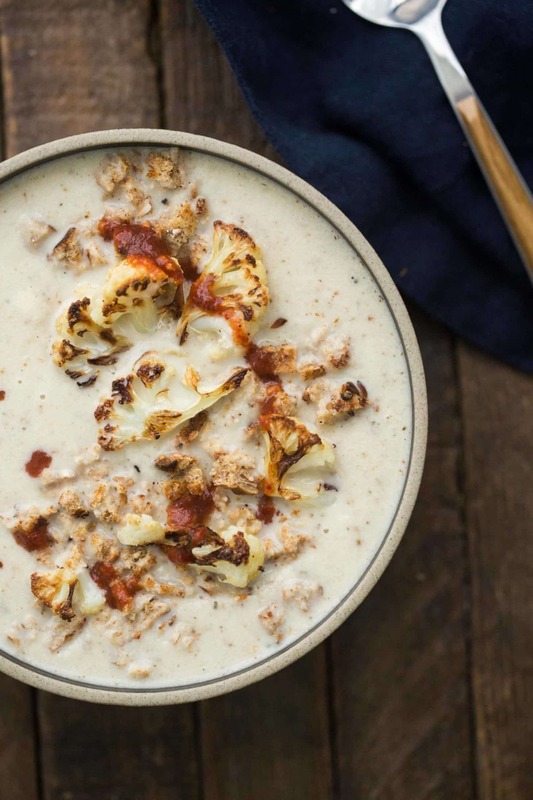 I never leave the toppings the same in this roasted cauliflower soup. The ones written in the recipe are pretty minimal but feel free to go wild. Try finishing with an herb sauce or herb oil. A nice swirl of romesco or harissa would also be lovely. Try toasted nuts or something like this sesame crunch would be great too. The toppings are really where you can shine with this recipe. Roasting cauliflower is by far my favorite way to prepare this vegetable (and if it’s a fresh head, you can cook the greens). I like to roast a big batch of cauliflower to use in this soup and another meal or two the next day. Add it to a salad with a handful of white beans, goat cheese, and a balsamic dressing. Add it to pizza with a bit of spice. Toss it with chili paste and add to a bowl of ramen. If you’re in need of more cauliflower inspiration, I have you covered. 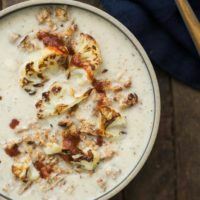 An easy roasted cauliflower soup that comes together quick and can easily be vegan by leaving out the heavy cream. Preheat oven to 425˚ F. Toss cauliflower florets with 1 tablespoon olive oil and salt. Place on a baking tray in a single layer. Roast, stirring once halfway through, until cauliflower is caramelized, 25 to 30 minutes. While cauliflower is roasting, heat a medium stock pot over medium-low heat. Add olive oil followed by the minced onion. Cook until onion is fragrant and translucent, 5 to 6 minutes. Add in the garlic and thyme, cooking for one minute more. Add in the vegetable broth and water, bring to a boil, reduce to a simmer, and let simmer until the cauliflower has finished roasting. Set aside a few small pieces of cauliflower for topping. Place the broth mixture and cauliflower in a blender and puree until smooth. If a perfectly smooth consistency is desired, pour the soup mixture through a sieve while transferring back to the pot. Once the soup is back in the pot, measure in the heavy cream and heat over low until ready to serve. Divide the soup into two bowls and top with breadcrumbs, leftover cauliflower, and hot sauce (if desired). Tips & Tricks: I find using only vegetable broth overpowers the flavors soup, so part broth and part water. Of course, you can replace all the water with vegetable broth if desired. The soup is creamy without the heavy cream if you would like to leave it vegan. However, the heavy cream adds a nice layer of richness that I wouldn’t miss. Use cashew cream, sunflower cream, or a non-dairy creamer. This looks so delicious! I am a huge fan of simple, comforting soups. Cauliflower is always a winner! This looks wonderful! I love roasted cauliflower as well — by far my favourite way to eat it. I just wish it weren’t so expensive right now! :/ Beautiful recipe and photos. I’ll be making it next time I can afford a cauliflower! Looks really lovely and the cheese suggestion sounds delicious. Can’t wait to try! This looks amazing!! I think I’d either use cashew cream or add another roasted veggie that will be creamy when blended, like potatoes. Cauliflower is seriously the best veg! I have a slight cauliflower obsession at the moment – so this recipe looks like a dream! I love that you use hot sauce as a garnish, I can’t wait to try it! Thanks for another quick recipe! Looks so good, I might even make it tonight. Roasted cauliflower is my favorite. Cauliflower may be expensive in Canada these days, but I’ll splash out on one to try out this recipe! I just curled up on the couch with a bowl of this soup and it is SO GOOD!! Looks perfect for the freezing winters up here in Beijing! I make a similar recipe, but with coconut milk added just at the end. Great work! Looks great — making this tonight! Assume you mince the garlic? Yes- thanks for catching that. Just updated the recipe. Yum! I love the roasted cauliflower garnish, so pretty! I’m a little confused. How much liquid total (water, broth) should I use? I used 1 1/2 cups of each. Was that too much? It tasted great but seemed like more than 2 servings. That’s how much I used as well and I’d say it’s 2 good-sized portions! OK. Great. Thanks for the awesome recipe. I made this with 1 T of chopped marjoram instead of the thyme, coconut milk for the cream, and topped with toasted pecans. It was delicious! Delicious! Thank you! Had to tweek this a bit to use what I had on hand. excellent recipe . I used coconut milk and a tablespoon of coconut oil to thicken it, not as rich as heavy cream, but worked out well. Is the thyme fresh or ??? I used dried for the recipe but you could use fresh. I would increase the amount slightly if using fresh. I just made this soup for dinner, i am not a big fan of it but mum loved it. We made this soup tonight, but turned it into a roasted garlic cauliflower soup. We used the same recipe, but instead of mincing the garlic, we roasted three heads of garlic and pureed it with the rest. We also left out the cream and stuck with the 1 1/2c stock, 2 cup water mixture. Granted we are huge garlic lovers, but it was delicious! What a wonderful soup! I added a leek and some garlic to the roasting pan plus a little herbes de Provence at the finish. Delicious, perfectly proportioned and so easy to make, thanks! This is delicious and I make it every week with the addition of the grated cheese. It’s so cheap to make because all the ingredients especially cauliflowers cost next to nothing to buy! Big hit with my husband and parents. Adding pre-soaked (and drained), blended raw cashews works brilliantly if you want a non-dairy cream. I’m a fan of comments by people who have made the recipe rather than just admired it – informative and helpful. Just made this soup and it’s delish. Adding a can of white beans before blending gives it a protein boost without affecting flavor. For liquid I just put in what I had used to steam some apples and chicken and a little milk. The recipe is flavorful enough that you don’t have to waste $ on store bought broth or stock. Loving this soup! This was amazing! And very simple, too! I added a large head of roasted garlic to the mix, and definitely did not regret it 😉 I served it with this piquillo pepper relish (http://www.finecooking.com/recipe/cauliflower-soup-with-marcona-almond-and-piquillo-pepper-relish), and it was really tasty. I also reserved a little of the soup before adding cream for my 10mo baby– He DEVOURED IT (he’s usually a bit finicky). Thanks for the awesome recipe! Another great recipe that will go in my regular rotation. So good! We love this recipe! I was wondering how long do you think it will last if I made this on Sunday. Would we be ok to eat it a few days later if left in the refrigerator or freezer? Thanks! This has become one of my favorite winter soups!